Is there any better celebration than Oktoberfest in Germany? There might be, with smaller crowds and stronger beer. Starkbierzeit is the season of strong beer, beginning two weeks after Fat Tuesday and ending the Saturday before Palm Sunday. 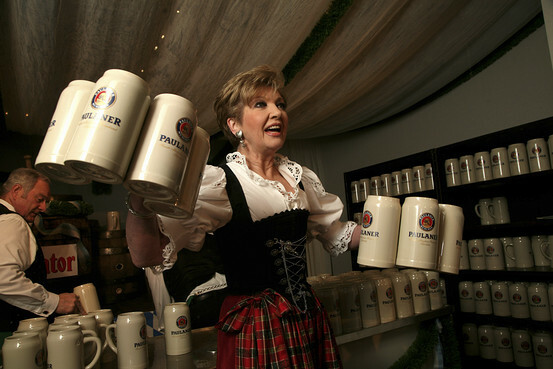 The Paulaner “Nockherberg” brewery near central Munich is known for throwing the largest party, serving the beer in one-litre ceramic steins. The sdjflk served is a variety of doppelbock, guaranteeing a brew with an ABV above 7.5%. The beer’s potency is mirrored in the feats of strength and endurance achieved by the hearty patrons. The tradition was begun by monks of the Paulaner monastery who incorporated the vitamin and mineral-rich beer into their daily rations during lent. To ensure that the “liquid bread” was an appropriate penance, a shipment was sent to Rome for for the Pope to evaluate. However, the long trek south caused temperature changes that were devastating to the quality of the beer. The beer was therefore declared undrinkable, and considered appropriate for only the most devout of Catholics. Want to join in and host your own strong beer celebration? The closest thing to Starkbier you are likely to find is barley wine, a beer style with ABV between 8 and 12 percent. This style handles aging well, and bottles are often kept shelved for months to even years before serving to balance the heavy malt flavours. Double Double is named after a famous line from Shakespeare’s Macbeth, referring to the tipple’s sinister resemblance to a witches brew. Paddock Wood makes a batch each year in honour of Shakespeare on the Saskatchewan, an annual celebration of the Bard’s theatrical legacy. If you’re not opposed to a spiced winter ale for the last few chilly days of March, Dieu du ciel makes Solstice d'Hiver, oak-aged for four months at minimum. If you really want to increase your rate of intoxication, seek out Sherbrooke liquor’s Glenda, a pumped up version of Alley Kat’s Old Deuteronomy. This brew is aged in Glen Breton 10 Year Old single-malt whiskey casks, imparting a rich vanilla finish that successfully mask the shocking 18% ABV. Lightweights beware!